With the help of BirdieBNL, we are proud to bring you, Kasty, the first custom Android 2.1 firmware ever released for the Arnova 8 tablet. It provides Android Market and root access to the Arnova 8 device. Thanks to HiLoGik for his support testing this firmware. 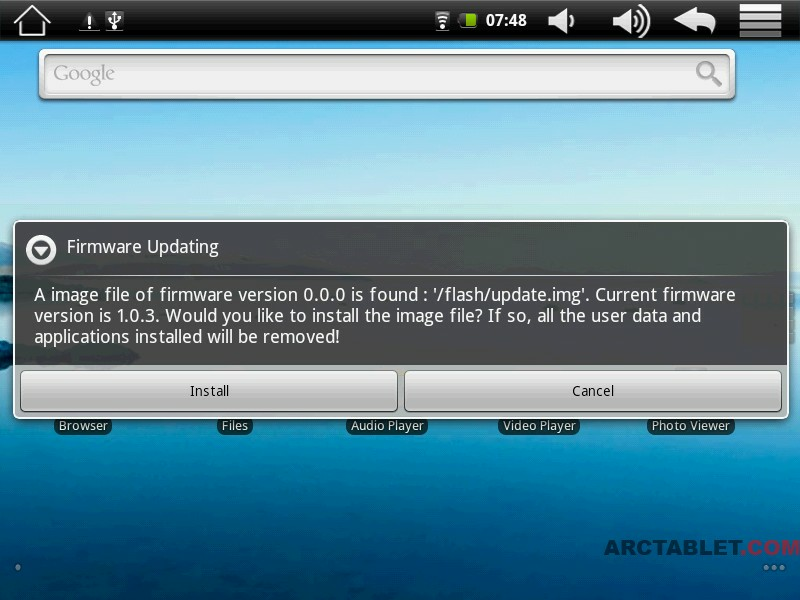 We are working on an Android 2.2 (Froyo) update for the Arnova 8, please stay tuned for an update. Anybody made Skype running on this ? I updated the firmware today and the installation was fine but I have no android market. I have just bought a ARNOVA 8 G1 8Go yesterday. I do really miss the Android Market. I tried to backup my apps from my phone (Motorola Flipout running under Android 2.1) via AppMonster but some apk files do not want to be install on my tablet. The only thing I have succeeded in is to download the official img file from Arnova. The tablet is starting, I succeeded in installing some apps but I still miss the Android market, Facebook, my bank application and a game for my child which did work on my mobile phone. 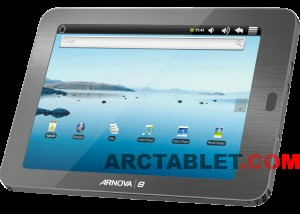 Is it work on an ARNOVA 8 4G or does exist something todo on this tablette ? Help! i have just installed the firmware of my Arnova 8 and all it seams to do is crash. Is there any way to stop this or reinstall the previous firmware it had? Any news on this update? Reading the comments below, it was announced for mid september… Still working on it? We are quite busy with other firmwares as well, will try to fix remaining problems on the Arnova 8 custom firmware as time permits, but it’s quite hard to set a release date. There are also some promising work on the CM7 (Android 2.3, Gingerbread) port for Arnova tablets, including the Arnova 8. I would be happy to see this by November, as not much left of October. is skype working for anyone? hello! have you any news about 2.2 firmware update? When I install the firmware 2.1 and open the market, it works fine. But after 2 or 3 applications installed the market gives for every application an installation error. I don’t know if it’s a common problem and if it will be fixed in the upcomming android 2.2 update but is there a fix or something like a workaround? I have the same problem, after 3 apps that i instaled from the market, it stoped working and I cannt download nothing from the market. I read in google that this is aproblem of alot of rooted devices !!! I just installed 2.1 and I’ve been downloading from market without problem. I probably have downloaded over 15 apps so far. The Market app actually stopped working eventually. My suggestion is to download all apps you need from Market right away after installation. It takes a few hours before malfunctioning. Hope this update fixes the Kindle problem. Just picked up an arnova8, have tried to flash with the above firmware and now find that the market and browsing crashes the device. Is this a wait for froyo thing (in which case any news on when that might be possible) or is it a get my money back and look for a new device? You can expect a little general improvement on the device, and a better Market (at least with less crashes). Still, the Arnova 8 being a low end tablet (as of todays standards) there is not a lot to expect with the resistive screen and the slow CPU. Thank you very much for your reply. I (and I hope everyone else) appreciate your efforts producing firmware upgrades. having said that – do you happen to know roughly when the froyo update will be available? We commented on releasing it by the 15th of September, so far testing looks good and we should be able to make it. Thank you, if there is anything I can do to assist in any way I am happy to donate my time. Any update on the 2.2 upgrade? Thanks so much for the previous upgrade! I love it! The Admin Prompt please where it is expected update to 2.2? It’s currently in the works. It will be released before mid september. The tension is killing me……..
PS. Thanks admin for the work that has been put into this, without awesome ppl like you instead of the tension killing me it would be the sadness for no hope of an update. Maybe we should stop teasing the Admin and wait patiently. The Tension is Rising ….. ? Any news on the Froyo 2.2 update? You wrote: “We have something almost working, a release should be ready in the next days”. Where???? Any news on the 2.2 update? Thank you and fingers crossed. Well, we all have the market place problem, so fingers crossed not long now to wait for 2.2 on the arnova 8, looks like 10 already got theirs. By Admin on 29 July. Like lots of people I’m starting to turn blue (holding my breath)! Just a fix for the current kasty firmware would be nice! Still cant download anything from the market place! Any news on a fix yet? Please be patient, it’s holidays time and we are busy here with all these new Arnova machines. We do confirm Froyo custom firmware is in the works and will be available before end of August. I think that we all appreciate the hard work that goes into this stuff. Thank you for your hard work so far. Any news on the Froyo update for the arnove 8 ? Esta versión funciona en el Archos Arnova 84? Meme pb impossible téléchargerment sur google market : échec du téléchargement ; veuillez réessayer. Ca fait 3 jours que j’essaie avec mes 1000 euros par mois impossible de m’offrir mieux. 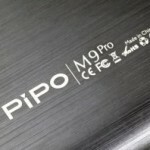 Just heard on the Arnova 10 blog that Froyo for the Arnova 8 might be available next week. Just curious, where is this “Arnova 10 blog” ? You posted it on july 29? Everyone please note – the link on “screen” on my previous post was not put there by me. I am not spamming this board. It seems to have arrived recently and I have no idea where it came from. Has anyone tried flashing the Arnova 10 froyo firmware on the Arnova 8? As far as I can see it is only the screen resolution that is different. Anyone have any idea how to hack the img to give the correct resolution? Don’t be shy – any ideas welcome! A froyo update would be extremely welcome. An update for the Arnova 8 to 2.2 would be great… Will keep following this website !! any news on 2.2 update for Arnova 8? Any ideas? Thanks for all your great work on this project! Please disregard earlier message. Fixed in the update. Thanks for amazing firmware update!! I am also having the same problem with Market not downloading with the kasty firmware. I also tried Arctools with the standard firmware but this also didn’t work. Does anyone know/has anyone tried the Arnova 10 froyo on the 8? We’ll try to provide a fixed Arnova 8 firmware soon. In the worse case, it may be a customized version from the Arnova 10. If you need any testers, I’m willing to help. I know you guys have alot going on with the Gen 8 and 9 tablets out there. I’m just thankful that you guys are taking the time to liberate and improve these devices. Are you guys still working on a 2.2 firmware for the arnova 8? The root mentioned above is great, but the features in 2.2 are much better. Any answer would be appreciated. I want to say cudo’s also to the crew that put this mod together. What an appealing option to open the arnova platform. Is it possible the os lost it’s mount to the writable space used by MarketPlace ? Même problème que tout le monde, téléchargement de 3, 4 applications, ensuite de quoi j’éteins la tablette, la rallume le lendemain, vais sur le market et impossible de télécharger. Avez vous une solution ? A quand la 2.2 ? Merci quand même pour le travail. an update to 3.0 honeycomb would be much better than to 2.2 froyo. PS: please fix the market problem with 2.2 froyo update. is there a release date for 2.2 yet? Dude thanks so much… works like a charm… here was i thinking i bought a useless tablet… and u saved the day…. I have a problem, I have a tablet, that de name is LAZER but is the same like ARNOVA 8. A80KSC. Is imposible for me to put this firmware. Is posible to root the tablet or do others things?. Yep, it is. Did that to mine. Download update.img from Arnova site. Download RKTOOLS (W9_0.18.20101201.214043.zip). Tutorial for this : http://www.hitechleague.com/wp-content/uploads/2011/03/Rockchip-Flash-Guide-Hitechleague.com_.doc. Ok I just wanted to put this out there incase anyone is in a similar situation. For what ever reason when I shut my tablet off, to reboot, the time and date get set back to january of 1969. If i try to use the market with this date set, they fail. A fix of the date to the correct current allows me to use the market successfully again. I also had the same problem when I had current date set, but had the amazon app store app installed. I don’t think that has anything to do with it. but Im putting it out there as a possible solution. That said, Is it possible to fix what ever is resetting the date to 1969 when you shut the device off? If not, I just won’t turn it off but every now and again. Thanks for this awesome rom though, can’t wait for froyo. It will be nice to watch youtube.com and hulu. it is possible to watch youtube.com on 2.1, too. I am also having this problem. I have plenty of free space so that is not the issue. It works when you first install it or reset it, but once you stop, go do something else and come back it doesn’t work at all. This wouldn’t be a bother, but some apps just cannot be found on any other market besides the main android App market. Also noticed that the Amazon app market doesn’t work at ALL. it always renavigates to the main page. so you only have access to applib. good market but seriously limited. Ooops … I forgot to mention that I did some tests with other markets (appslib / applanet), downloads and installations work fine. I also installed Flash_For_21.apk … which is supposed to install the Flash to Android 2.1. But it does nothing. No visible effect. I also specify that I do not know much about Android, it’s my first Android hardware. Good work! guys! But waiting for Android 2.2 with flash support! Merci pour ce firmware et ses ressources. Est-ce un problème de langue française ou autres? J’ai réinstallé l’image et même restauré les paramètres d’usine. Cela a marché à nouveau 2 fois puis ensuite même blocage de téléchargement. True, I have this problem too. Initially I tested the android market by downloading a “big” apps for free (FnacBook), and the test was all good. But since I wanted to load other apps on the Android Market … and downloads no longer work. I think it’s a matter of checking free space … or a real big problem of space for apps and the market. Or maybe the market does not clear its cache and its data.